Minister Louis Farrakhan (HMLF): Oh, my brother, it's my great honor, privilege and pleasure to be your guest on WLIB and to be able to speak to the wonderful brothers and sisters of New York City and the surrounding area. Thank you so much for this privilege. GB: You are more than welcome and we are more than appreciative, believe me. Why is it important for you to come to New York for the upcoming Millions March in Harlem, scheduled for Aug. 13? 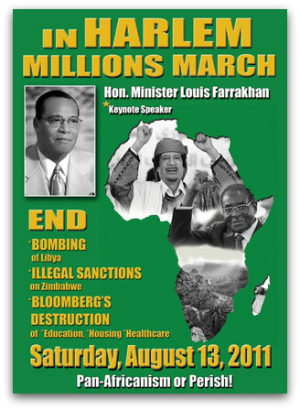 HMLF: Well, as you may know my dear brother, Sister Viola Plummer and the 12th of December Movement came up with an idea and thought that the enemies of Africa were planning to recolonize Africa, and she wanted to hold a march in Harlem to gather Black people together to alert us to this ugly fact that the Western powers are planning and are in active form of recolonizing the mother continent. And we cannot sit by and allow this to happen without our feet marching, our voices being heard and organizing throughout the country to let our government know, and the governments of the world know, that we will not stand by and allow the mother continent to be recolonized by those who have sucked her blood over many centuries, and now wish to do it again. GB: There is a place in which the march is projected, and obviously we've had some conversation along the timeline with the December 12th Movement. As I indicated, the theme focuses on the attack on African people on the continent, which you just responded to, but also adds the attack on African people in the United States. What is your perspective on that part of the agenda? HMLF: Well, as our people know, we are suffering more now than we ever have. And even though we have a larger Black middle class, and we have many Black millionaires and a few Black billionaires, the masses of our people are continuing to slide backwards into poverty and want. We cannot allow in a new election season our brother president, who gained 97 percent of the Black vote in 2008, to go to sleep and think that he can take the Black vote for granted. He has spoken out on gay rights and on unions and on other things that affect many people. We want him now to address the deep thirst and concerns of Black and Brown people in America who are now suffering from great injustices: police brutality, racial profiling, loss of jobs, loss of money. We need the president of the United States to speak out for us, and we need to unite and speak for ourselves.